2012 Holiday Party - a Big Success! It was a great turnout for our annual holiday party and everyone who came showed a great deal of holiday spirit. Attendance was augmented by a very special announcement by our treasurer George van der Wouden. His son Steven and the rest of the van der Wouden family used the occasion to celebrate his engagement to Meagan Markessinis. President, Ron Tanner reviewed the club's activities and briefed the group on the upcoming 2013 events which will include hosting a regional event. A slide show of the year's programs was prepared by Tim van der Wouden. There were a lot of smiles as pleasant memories of the past year were viewed. The holiday dinner party was held Saturday, December 16, 2012, at Treviso by Mallozzi's at the Italian American Community Center, 257 Washington Avenue Extension, Albany, New York. Many thanks go out to Chuck and Bobbi Trimarchi for planning the event and seeing it through to its very successful completion. packed with imports and domestic cars, trucks, SUVs, SAVs and even convertibles for astounding offers! No purchase necessary. Must register in person on either day of event during sale hours. One winner per household. "What is it?" "Where is it?" Why?" "What to do about it?" "Runs like a top." Learn something. Good friends. Free of Charge! Shine up your car, display it proudly indoors. Prizes and fun. FREE for new members and a guest if you joined since April 2011!!! $30 each for members prior to April 2011. Please arrive at 11:30 AM for photos with your car!! All this and more in one day! Sat. Jun. 15 8:30 AM - 4:30 PM - Street Survival: "It's more than driving - it's about living!" Sign up your teen and/or 20-21 yr olds today! (Parents are encouraged to stay for the school day if they wish.) The primary emphasis of Tire Rack Street Survival is a "hands-on" driving experience in real-world situations! We use your own car to teach you about its handling limits and how you can control them. "Few people realize driving is one of the most dangerous things they do. A car traveling at just four mph has more energy than a bullet. That's a lot of responsibility." - Bill Wade, National Program Dir. Sat. Jul. 13 - Annual/Regional Car Show: Stars at the SPA "Celebrating The Golden Age"
Competition classes include, Modern (15 years or younger), Classic (50 years or younger) Antique (over 50 years old) with both Concours, Concours d'Elegance, and popular choice (to be judged by the public). Awards will be given for the most authentic festive attire depicting the dress for picnics and celebrations in the early days of Saratoga Springs. Start putting your period outfits together today and join us for the fun. There will be music, fashion, food, fun and great fellowship. The Entry fee for MBCA members is $75.00 per person, payable in advance. This will include your entry in the show, snacks during the day, and a very special three course sit down dinner in the Arches at the famous Gideon Putnam Hotel. The hotel is located near the Auto Museum which is in the beautiful Saratoga State Park. A cash bar will be available in our dining room. The entry fee for the show only is $25.00. The entry fee for non-members is $49.00. This will include a free membership to the Mercedes-Benz Club of America. If you want to attend the dinner, the cost for both registration and dinner for non-members will be $99. You can read additional information and comment at DiscoverSaratoga.org, SaratogaAutoMuseum.org, MBCA.org. at Saratoga Race Track . 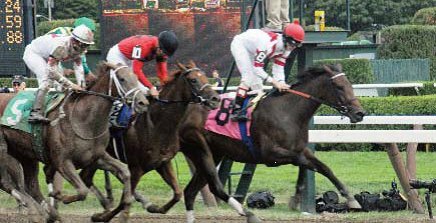 Join us to celebrate the finale of the 150th Anniversary Racing Season at the famous Saratoga Race Track for a day of food, music, and of course, races! We will have a reserved place on the home stretch in an air conditioned tent. Great fun and a chance to win big! See you there and good luck. Flier and Registration Form available here. A Driving Event in the Fall Color - the 36th annual Farberallye, this year in Waterville Valley NH, in the heart of the beautiful White Mountains. Visit their web page for further details. Sat. Oct. 5 - Fall Rally and Tour - This is our own section's event that you won't want to miss! Join with other Mercedes-Benz drivers (actually any brand of vehicle is welcomed) as we do a challenging rally through beautiful hillside and horse country on roads seldom traveled. The rally will begin at Gigi Market, 227 Pitcher Ln, Red Hook, NY 12571. (Gigi Market is part gourmet, part deli, and part bakery where you will find some great eats - delicious bakery goodies, fine salads, every ones favorite this time of year - cider donuts, and some of the best coffee you will ever enjoy, so you're welcome to arrive an hour or so earlier for a great Farm Fresh Breakfast.) Pitcher Lane is off Route 9 and the market is about ½ mile up the street. The $10 fee per car is payable at the start line. The fun will begin at 11:30 AM with a drivers meeting. As we step off you will be headed into the most beautiful rolling hills and horse farms that Dutchess County has to offer. It will end at a surprise restaurant in Dutchess County, where you can have a late lunch or early dinner in a scenic setting. This year we are adding a rallye component which will make this a very exciting event. The rallye, while not a 'speed and distance' event, will be a challenge for all. The route has been driven three times, but is somewhat tricky, offering those who participate an opportunity to use their mapping and riddle solving skills. The course will present challenges to all, even the most experienced. It will be a chance to have fun while you test your abilities. These routes are setup so that a GPS is of little use, and we have done our best to be sure someone gets lost, which is part of rallying. Don't worry, each car will have a 'Panic Button' map which can be opened if you are totally lost. Do plan to join the challenge! For those who choose to just do the 'Tour', you will travel the same route as the rallye, but at a more leisurely pace. Your route will take you on many roads less traveled with a great number of photographic opportunities. This has always been one of the Hudson-Mohawk Section's most popular events. Please join your fellow members and help us to continue our successful track record. Cost: $10.00 per car, payable at the start line. Please let Ron know AS SOON AS POSSIBLE as we need the list of Participants for the Restaurant. We have ordered "top down weather" but we will throw the starters flag whether rain or shine. Bring a potential club member with you. P.S. : Congratulations to Dan and Gail B. for correctly providing all 31 answers to the Rallye questionnaire! Thu. Oct. 10 - Special preview of "Big and Bold: Contemporary Paintings, Collage, and Sculpture from the Albany Institute's Collection"
We are pleased to offer the following kind invitation for what sounds like a pleasant and enlightening evening for some of our members and associate members at the Albany Institute of History and Art (located at 125 Washington Ave., Albany New York): "The Social Committee of the Albany Institute of History and Art is pleased to welcome the Hudson Mohawk Section of the Mercedes-Benz Club of America to the October edition of our "Inside the Institute" series, on Thursday, October 10 at 6:30 PM. This intimate, invitation-only event will consist of a guided sneak preview of the exhibit "Big and Bold: Contemporary Paintings, Collage, and Sculpture from the Albany Institute's Collection" (in the Institute's recently renovated Lansing gallery). The evening will also include a behind-the-scenes tour of the Museum's state of the art storage facility. Wine and light hors d'oeuvres will be served. We look forward to seeing you there, and introducing you (or possibly re-introducing you) to all the Institute has to offer. The museum has indicated they can accommodate up to 16 people, so we will provide them a list of attendees based on a first come basis. Hudson Mohawk Mercedes Benz Board invite you and your guests to the Annual Holiday Party. This page last updated at 23:50:34 EST on February 21, 2015.